What Happens if I Miss a Court Date in Morristown? If you have been charged with a crime and you have been given a court date, you must appear for it. In fact, you may need to keep track of several dates related to your criminal charges. It is important to note these dates and make arrangements to attend your hearings. These hearings are a vital part of the criminal process, and you will only be able to fully assert your rights if you appear. Failing to appear in court in New Jersey may lead to serious consequences as well. It may even have a negative impact on the final result in your case. If you know you have missed a court date or you recently learned there is an outstanding warrant for your arrest, you should take steps to retain an experienced criminal defense attorney as soon as possible. Our firm defends clients in criminal cases involving assault, drugs, shoplifting, weapons, and more throughout New Jersey. We can also help you resolve a warrant or pending case if you missed a court date in Morristown, Denville, Dover, Parsippany, Rockaway, or elsewhere in the Morris County area. Call our local office in Morristown at (908) 336-5008 for additional information and a free consultation about your case. If you miss a scheduled court date in Municipal Court, the judge can, and usually will, issue a “failure to appear” notice. This notice will either simply reschedule the hearing (which will be provided to you in the mail) or the court will issue an arrest warrant. That means that you will have a warrant out for your arrest compelling you to appear before a judge for the crime alleged and a separate offense for failure to appear. If you appear for the rescheduled hearing or if you are brought in based on a warrant, you will have to explain to the judge why you failed to attend the first hearing. Unless you have a valid reason for not appearing, you may face serious penalties for contempt of court. This is because failing to appear for a hearing in New Jersey is a direct violation of a court order, and it comes along with its own separate fines and other consequences. If you have an emergency that forced you to miss the date, then you will generally need to provide proof of that emergency to the court. For parking tickets, the judge will generally only issue a warrant when you miss two scheduled court hearings. The judge also has the option to revoke your driving privileges until you appear for your court date for any criminal or traffic offense. This type of consequence often means higher fees, and it can take longer to get your case resolved. In New Jersey, Superior Court is reserved for much more serious offenses, known as indictable crimes or “felonies.” This often means that missing a court date will result in harsher penalties. 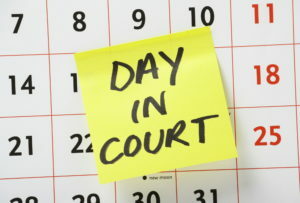 In criminal cases in Superior Court, Judges are much less likely to show leniency to those who miss these court dates. In fact, missing just one of these dates will lead to a warrant for your arrest being issued automatically. Another potential consequence for missing a hearing in Morris County Superior Court is that you forfeit your ability to remain outside of jail. That means that you do not have the option to post any amount of money to get out of jail and you will remain in detention until your case is resolved. The judge can do this under New Jersey’s new bail laws because part of the bail decision includes whether or not your are reliable to make your scheduled court appearances. If you received a notice for failure to appear in court or there is a warrant for your arrest in Morris County, it is a good idea to get an attorney involved as soon as possible. Your lawyer can make arrangements with the court or law enforcement to turn yourself in after a warrant has been issued for missing a court date in Superior Court, or contact the court and arrange to have a new court date scheduled in Municipal Court. The skilled criminal defense lawyers at The Tormey Law Firm can help with this process and minimize any potential damage done. Learn more by contacting us today at (908) 336-5008.